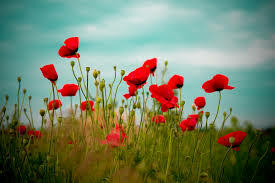 “In Flanders fields the poppies blow, between the crosses row on row…” So begins the poem by John McCrae, a Canadian brigade doctor engaged in the Second Battle of Ypres, during The War to End All Wars. 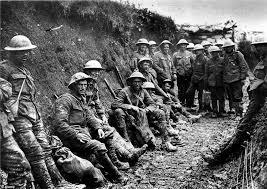 World War I. Dr. McCrae wrote the poem, it is thought, sometime after the burial of a comrade who was killed by an exploding grenade near him. The poem goes on to speak of the larks, still singing in the sky, high above the devastation and death that lies below. This detail, the singing larks, and the feel of a low country breeze—these normal things—move through the boys’ letters homes, their journals, their memories. 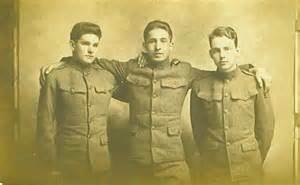 For they were boys, most of them, caught up in the Great War, and for those lucky enough to return home, the war haunted their dreams with its cruelty, it’s unmitigated horror. This war, fought from fox holes, tunnels, and across broad fields, has all but slipped the pages of the high school history books, getting a few pages of ink, not much more. Even so, anyone reading “Lord of the Rings” has read about this war. J.R.R. Tolkien has given us a glimpse of the war, even though he would state that the impact of the war in which he fought had limited impact on his writing. But surely the war shaped some of the imagery he used, and some have said reading “Lord of the Rings” is eerily similar to reading accounts of World War I. Real accounts, historical and fictionalized, exist, however. Two of the best are these. “The Guns of August” and “All Quiet on the Western Front.” The historian, Barbara Tuchman, says of her approach to writing history, “I make up nothing, not even the weather.” For “The Guns of August” she culled her research from primary sources, letters, journals, news accounts, military logs, and if she wrote that the sun rose at dawn as a flaming red ball, it is because she read in numerous accounts of those there on that morning that the sun, did indeed, rise in the sky as a flaming red ball. Her research is meticulous, and she visited each battlefield in the season in which the battle was fought, so that she might understand not only the facts but the atmosphere, the weather, the way the light falls across the fields in fall, let’s say, or winter. “All Quiet on the Western Front,” the novel by Erich Maria Remarque, tells the story of six German soldiers suffering physical and mental hardship in the war. It is an apolitical account of war, seen from the lowest vantage point, the view of the foot soldier, and it could as easily have been written by an American, a Canadian, or a Brit. The war experience at its most basic must surely be universal. My grandfather fought in World War I. He slept in French barns, he admired the little German towns and villages, even though it was the Germans he was there to fight. He spent time in Koblenz—I stayed there over sixty years later. It was late, we were traveling by train and running out of options for places to lay our heads, and someone took pity on two backpacking girls and led us to a pensione. The next morning we woke from a restful sleep, swaddled as we were in eiderdown, to a pretty town on the banks of the Rhine, just where it joins the Moselle. As I recounted my trip to my grandmother, she told me then that my grandfather had been to Koblenz, admired it, admired the German people, even though it was they we were fighting, which baffled him. Traveling through the French and Belgian countryside one is struck by the vibrant poppies bobbing on slender stems. It reminds us of dreamy watercolors by Monet. After Dr. McCrae’s poem,–after the end of the war on November 11, 1918, at 11 o’clock, in the eleventh month, after the boys came home–the poppy took on a deeper, more solemn meaning. The poppies we see on the lapels of our British cousins at this time of year are known as Remembrance Poppies. They stand in stead for the fallen. The field poppy, this delicate flower, blooms in the late summer in Belgium and France. It bloomed against the odds during the war in fields turned over and utterly destroyed, bloomed where their seeds had fallen the year before. Bloomed in the smoke and fog of war. Bloomed in fields brown and barren and littered with spent artillery shells. Bloomed with and around the fallen.